FALCONER. The name, in and of itself, conjures up images of medieval castles, dragons, knights, wizards and, of course, damsels in distress. If this isn't enough to set the stage, the album cover art leaves little doubt that this is pure metal in one of its myriad forms. Black Moon Rising, FALCONER's eighth CD (since 2001, an impressive output level), is a strong outing in their famililar "medieval" style - but not in themore baroque DIO-era RAINBOW sense. Rather, it's their their brand of power metal crafted around Swedish folk metal influences, a little black metal and a boatload of classic metal riffs, MAIDENesque harmonies, and slightly progressive song structures. Guitarist, songwriter and band mastermind Stefan Weinerhall remains at the helm, joined by fellow guitarist Jimmy Hedlund, who assists with the harmonies and adds the requisite modern lead guitar work. The band is rounded out by the poweful rhythm section of drummer Karsten Larsson and bassist Magnus Linhardt. Last, but certainly not least, is vocalist Mathias Blad, who really helps to set FALCONER apart from their contemporaries. His delivery, diction and pitch are nearly flawless, but his style is markedly different from most power metal singers in that he is a classically trained theater vocalist. Blad delivers the songs in a rich baritone as opposed to the standard power metal tenor; the pairing of his voice and the music breaks the stereotype - and it works. 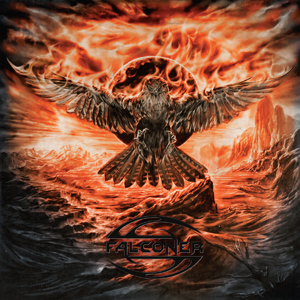 FALCONER generally falls into the "folk metal" category because their music incorporates folk melodies and subject matter (can a band have songs titled "Scoundrel And The Squire" and "At The Jester's Ball" without being tagged as folk metal?). The band also identifies themselves in these terms, but on Black Moon Rising this vibe come more from the approach to the guitar and vocal melodies and lyrics than the instrumentation. Yes, they have incorporated some acoustic guitars and folk instruments in the past, but not to the same extent of many other bands in the genre. Furthemore, on Black Moon Rising the focus is on a sharp two-guitar approach, with plenty of leads and harmonies throughout - and thankfully, an absence of the gutteral vocals that plague many albums of this ilk. The point is that FALCONER really has the elements to appeal to a fairly broad array of metal fans, even if they are not particularly fond of or familiar with folk metal. The folk elements serve to keep things from being too prosaic, while the classic metal riffing and guitar approach provides a point of reference to draw listeners into their particular style. The point is that rather than folk metal or folk/power metal, power/folk metal seems the most appropriate classification. FALCONER fans won't find a lot of surprises on Black Moon Rising - but that's not necessarily a bad thing. Stefan Weinerhall maintains his reputation for impressive writing and arranging skills with a collection of speedy, aggressive - and sometimes heavy - songs. Also, this time out, the band has left behind all pretense of singing in Swedish (as on 2011's Armod), and most of the trappings (none bad, by the way) of former outings; it's a direct approach and possibly their most "metal" album. A stream-of-consciousness overview of the material includes opener "Locust Swarm", which is built on riffs that borrow from almost every metal genre with Blad's smooth vocals on top. The title track "Black Moon Rising" has a standout chorus, while "Scoundrel And The Squire" supports the folk metal tag. "In Ruins" offers more folk melodies combined with a healthy dose of harmonies and double-picked riffs. "Age Of Runes" is a heavier track, and the disc ends with the gothic subject matter of "The Priory" (note the dragon references!). The production is thick, full and crisp - with the guitars leading the charge - courtesy of Andy LaRoque's (longtime KING DIAMOND lead guitarist) Sonic Train Studios in Varberg, Sweden. FALCONER has recorded their entire catalog at this facility with great results. It's hard to find any significant fault with the sound of this disc; it's a bit grittier and slightly darker than previous efforts, but it's a sonic fit for the subject matter and style of the material. For those already familiar with FALCONER, rest assured that this is a high-wattage dose of the same. If you are a newcomer to the band or looking for some thoughtful and classy European power metal with an interesting and folky twist or two in the formula, Black Moon Rising hits harder than the jousters at the Rennaisance fair. Grab a copy of Black Moon Rising in the KNAC.COM More Store right HERE.